Pancakes are definitely my favorite breakfast. Don’t get me wrong, I love my hearty bowl of oats, avocado toast or even just a big cup of an almond butter chocolate smoothie. But to me, nothing beats flipping pancakes, stacking them tall, and topping them with fresh fruit & a drizzle of homemade sweet sauces or just simply with maple syrup. I ate relatively healthy most of the time when I was growing up (casually ignoring all those galaxy chocolate bars and nutella jars I lived off), so when my mum or I made pancakes, it was such a special treat. Luckily for us, we can still enjoy fluffy pancakes that taste amazing and won’t make us want to take a 4-hour nap after eating them. It’s a win win! Usually people enjoy pancakes on the weekends because they’re not the fastest breakfast to make – which isn’t great when you have to get to your 9 am class or start work super early but still want to sleep in. These are something to really look forward to as the weekend approaches! The healthy, naturally sweet combo of fruits and chocolate (combined with the fibre in oats) will keep you satisfied and feeling good all morning. Who wouldn’t have a good day if they started it with chocolate?! Coconut drizzle: Using a food processer, mix the coconut flakes. Scrape down the sides as necessary. Add vanilla and mix again. While the mixture is processing, add in splashes of coconut milk until it resembles a sauce-like consistency. Pancakes: Heat a skillet/pan over medium-low heat. Mix the milk, oil, maple syrup and vanilla in a small bowl and set aside. Whisk the flour, baking powder, cacao powder, and salt in a separate bowl until combined. Add the liquid to the dry and mix with a wooden spoon until just combined. Add a touch more milk if it’s too thick. Drop small scoops of batter onto the lightly greased skillet. When bubbles start to peak through the surface and you see a bit of light browning/crisping up on the underside, flip the pancakes over carefully, about 2-3 minutes. Repeat on the other side, remove from the pan. 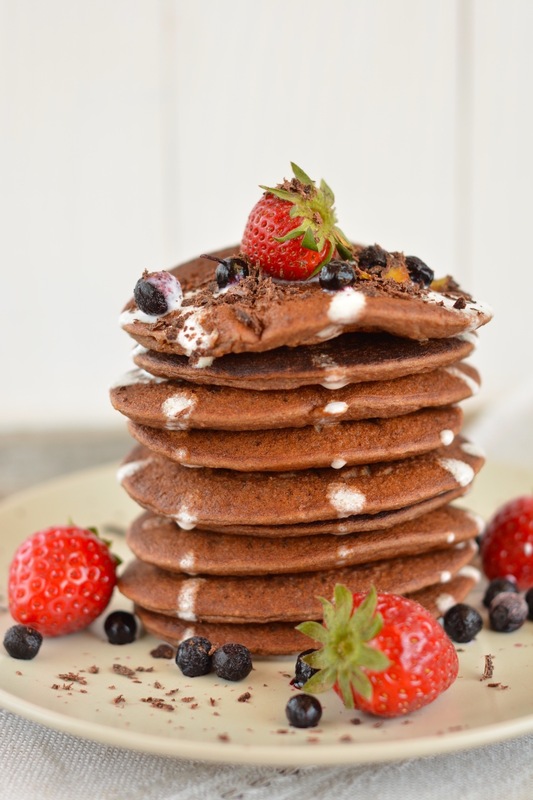 Top the pancakes with a drizzle of the coconut sauce along with blueberries, strawberries and more chocolate if you wish!